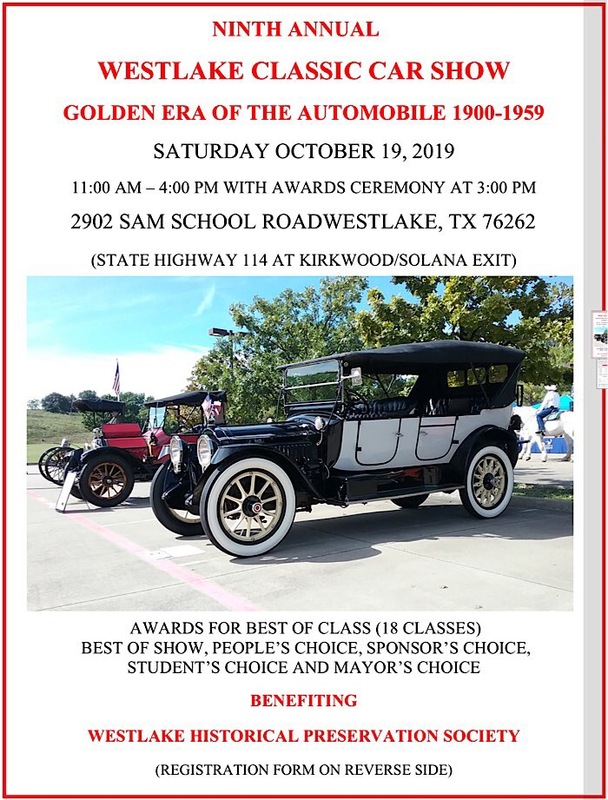 The Ninth Annual Westlake Classic Car Show to be held on Saturday, October 19, 2019 (Rain Date is Saturday, October 26th) at the Solana Club located at 2902 Sam School Road in Westlake, TX 76262. The Westlake Classic Car show is dedicated to the Golden Era of the Automobile, the first 50 years of automotive history, featuring 1909 to 1959 originals or restored to near original automobiles and trucks; no hot rods, no customs, no muscle cars, just true classics! Each decade has been well represented by sedans, convertibles and pickups in each class and included many very rare and unique automobiles. Show registrations are limited to 100 original or restored to near original classic automobiles, trucks and pickups per the classes shown below. Show set up will be from 9:00 AM to 10:30 AM and open to the public from 11:00 AM to 4:00 PM with awards at 3:00 PM. Awards will include Best of Class (18 Classes), Best of Show, People’s Choice, Sponsor’s Choice, Student’s Choice, and Mayor’s Choice.